NEVER DILUTION: Our Proking Whisky stones are a excellent design to the liquors. They do not melt and dilute your drink. It will keep the flavor of your favorite whisky as it chills. Do not worry your whisky, Proking whisky stones will never ruin the real taste like ice cubes. They just keep your whisky cool and give the original taste experience for you. IT WILL BE A BEST GIFT FOR YOU AS THE FIRST. 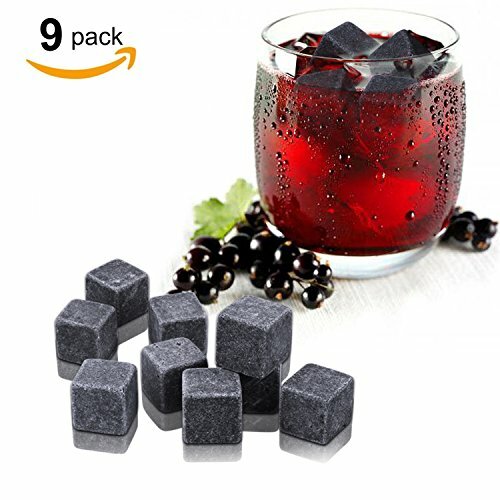 FDA APPROVED FOOD MATERIAL: Proking whisky rocks are made of 100% Natural Premium Granite Stones, using a high-tech polish process to avoid scratching your cup, and easy to clean after used. They have pass the FDA approved, so you do not need to worry about materials. Actually, Proking whisky stones will not destroy the taste of whiskey. You just need to wash them in time after used. And they would be reusable for several years. EASY & CONVENIENT TO UES: You just need to place our Proking whisky stones in the freezer about 2-4 hours, then you can put it in your whisky or drinks. Each size of the stones approximate 2cm3. In order to get a good taste experience, you have better put 3-4 stones in per drink. The rocks will stays cold, ensure you will get a smooth and leisurely drinking experience in the Cocktail Party or your family mini bar. Spirits or soft drinks will be ok.
100% CUSTOMER SATISFACTION GUARANTEES: Our Proking provide 100% guarantee of money back and replacement due to defects of our whisky stones. You can contact us through the After sales email---( prokingaftersales@aliyun.com ), and we will reply within 24 hours ASAP. If you have any questions, please feel free to contact us, we will do our best service for you.